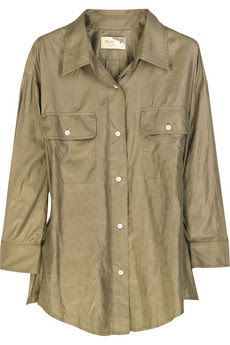 Whilst thrifting last month, I spied a silk khaki shirt for only £1.99. I picked it up and thought about it and put it back and went home. After looking at Net-A-Porter and 'Look' magazine, I realised it would be a great buy after all so I went back and snapped it up!! My shirt by Debenhams is from the Salvation Army charity shop and for silk was a fabulous bargain at only £1.99. 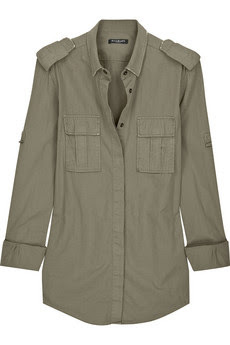 What items of khaki/military will you be in this summer? 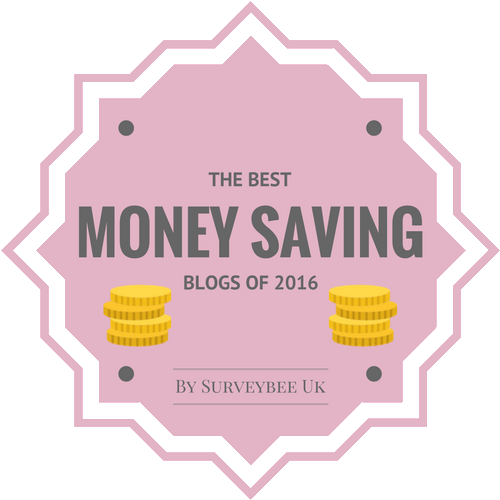 It's weird how we sometimes save at the totally wrong time... The same happened to me with a leopard print chiffon blouse for a few quid and I was 'nah, I'll save the money'. I could still hit myself! Imagine if you bought the Balmain at £705!! Oh I am now completely obssessed with khaki! I've been wearing an old military jacket all week, also found an old M&S /Ghost-inspired hooded crinkle viscose parka in the wardrobe which I've been wearing with jeans - not long now before I break out the combat pants! Great find, dearest Sharon! U are the best! Well done you and amazing it was still in the shop to snap up! A silk shirt is just the easiest thing to wear this season. I will get some better pix posted of my Dior goodies next week. 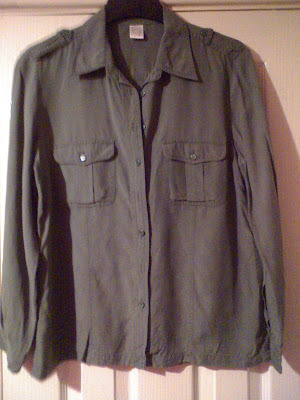 Great find and it is such a keeper, there is always going to be some form of military/khaki/safari trend going on and I think such a classic shirt will never be 'out' of fashion - unlike one of those bonkers Balmain tops with all the holes and chains - I must be missing something with that trend LOL! I've got khaki dresses and cargos just waiting in the wings! that really is a bargain, and very versatile. good that you went back and go it! have a lovely weekend! I like it! 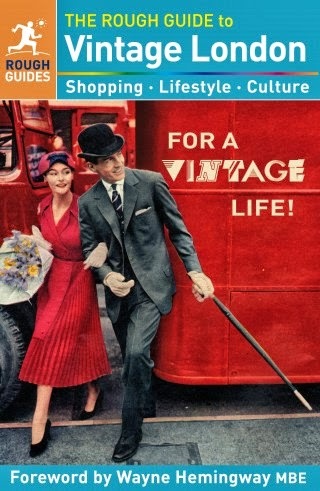 I'll keep my eyes open for something similar as I thrift my way back from South Carolina back to Indiana, USA! Brilliant Find - I get all exhausted just thinking about how you manage to do it - like - all the time! Such a fab shirt! It'll look amazing with denim. Don't scare me by making me think you missed out on a great bargain! Hi everyone-thanks so much for all the lovely comments, as always they are so much appreciated!! Hi Sharon-Rose; just popping by to say hi; hope you are well! Sharon i love how you always find on trend pieces from your charity spots. The fact that is silk is glorious! Hi everyone-thanks so much for the comments! Hmmm...khaki is still a bit of a strange colour for me. Don't know if I can be quite won over yet.